Prysmian Group, world leader in the energy and telecom cable systems industry, will exhibit its state-of-the-art range of products and services for the offshore wind industry at the 2018 edition of the Wind Energy event in Hamburg, Germany, from 25 to 28 September (Hamburg Messe und Congress, Hall B6, Booth 553). Wind Energy Hamburg 2018 is a key industry event for the Group to present its developments in innovative, sustainable and cost-effective cable solutions for the offshore renewable power sector, including HVDC technologies for offshore wind farm applications. In addressing the direct needs of the sector, Prysmian PowerLink Chief Operating Officer, Raul Gil, will also be speaking at the “Looming trade wars: what implications for the wind supply chain?” session (27 September). Wind Energy Hamburg 2018 will be the occasion to display Prysmian’s full portfolio of products and services, including its high-performance 66 kV cables system for inter-array networks, HVDC technologies, AC and DC power transmission submarine cable systems and solutions specifically designed to meet demanding conditions and high resistance to abrasion, UV radiations, corrosion, bending and torsion stress, for increased efficiency, reliability, safety and cost-effectiveness, as well as its asset monitoring systems and services. Prysmian will also present its innovative Power Link Cable Solutions service designed to provide a comprehensive and effective asset management of submarine cable operations, from prevention to repair, dramatically lowering asset downtime and remarkably reducing total cost of asset ownership. The system is based on the Group’s proprietary PRY–CAM revolutionary wireless technology that allows fast, accurate and effective online and reliable Partial Discharge measurements, diagnosis and defect localisation, without having to switch the system off and covering every aspect of condition assessment for any electrical equipment from 3 kV to 600 kV. Collected data are stored via the cloud to be accessed and shared remotely. 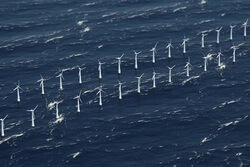 Wind Energy Hamburg 2018 will be the occasion to prove the Group’s leadership in the offshore wind market, becoming the undisputed “one-stop solution provider” for Transmission System Operators and Offshore Wind Farm developers. The Group can offer complete cable system solutions and services, considering innovative approaches, utilising extensive engineering resources, manufacturing facilities and a wide range of installation vessels and burial equipment.